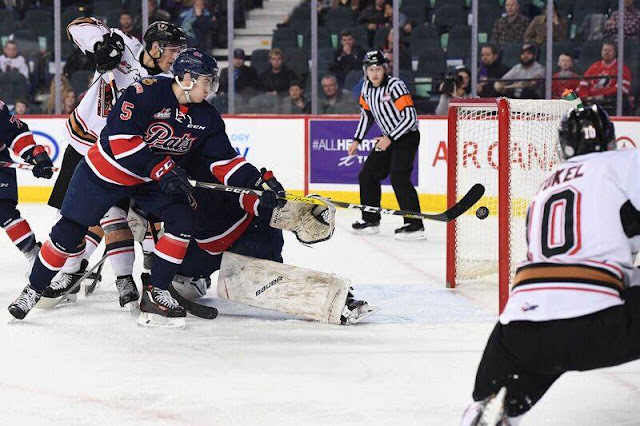 Calgary, AB – A three-goal first period powered the CHL’s top-ranked Regina Pats to a 4-0 victory over the Calgary Hitmen on Wednesday evening at the Scotiabank Saddledome. WHL leading scorer Sam Steel recorded two goals and added a pair of assists for the visiting Pats which have won their last nine contests. Connor Hobbs also contributed with a four-point effort (1g, 3a), netting his goal on the visitor’s second 5-on-3 advantage, while Nick Henry rounded out the scoring. Goaltender Tyler Brown made 28 saves for his fifth career WHL shutout as the Pats fired 30 shots against Hitmen netminder Trevor Martin. Regina outshot the home team 30-28 while going 3/6 on the powerplay and 6/6 killing penalties. The attendance at Scotiabank Saddledome was 5116. The Pats return to action Friday evening when they visit the Edmonton Oil Kings in an 8:00 Sask Time faceoff on 620 CKRM. Coming soon to a rink near you - "The Undefeated"! The trolls are quiet today...great game boys! Always good to see the pats win!!! These guys are scary good!!! Watch for Steel dressdown goal on WHL Highlights of the week...what a beauty!! Another game where Pats in complete control and Brown very steady in net. This is certainly a key down the road as both he and Hollett have to be solid and not give up any easy ones. Wagner again had a good game although he & Brooks never hit the score sheet. It's a good sign when 2 of your best don't get a point and yet you win going away 4 - 0. That's called depth and hard for even good teams to shut them all down. Also missing 2 of 3 good players from 3rd line with injury and suspension. Need to complete this mini-road trip with 2 more wins then get ready for the big one on Tuesday at the DOME! Another great win! Looking forward to heading to Alberta to catch the game in Red Deer on Saturday! I'll be cheering hard loud the Pats! Anon #2 . " The Trolls Are Quiet Today" !.. Only reason the Trolls are quiet is because lately if you don't say ANYTHING POSITIVE about the Patsies or the Riders you don't get on here . I guess Mr. Pedersen wants this site for Regina people only, so if you don't live here and you are not a Pats or Riders fan then you don't get your two bits worth in. Sure not the way to run a so called "Open Line " show . Let the people talk who cares who slams who, as long as it doesn't get stupid or filthy dirty. He sure publishes all the NEGATIVE things that are said about the RUSH in Saskatoon and that should also include the Blades. Just to let you know I am not from Saskatoon or Regina but I am an avid Rider fan and that is all I have to say. Thanks for publishing this Rod I'm sure thousands of others in this Province feel the same. This is amazing to see the Pats relevant again! Can you see the wagon? Jump on it's going to an amazing ride. Going to the game in Edmonton tomorrow night and Red Deer on Saturday. Should be an interesting game in Red Deer after all the trades. Go Pats... I wanna see 50 wins in the regular season! I remember back in the day when I used to use that Steel goal move with one arm/hand to perfection. Mr. Weppler - Adam Brooks had an assist on the 4th goal. Also of note: Tyler Brown has earned his way into the top 10 list of WHL goaltenders with a GAA of 2.74 and SAV% of .910. He's played great lately. Hopefully he stays sharp for the rest of the season. Sorry about the Brooksy point error...was just going by what they said on the goal announcements on WHLLive broadcast I was watching. Yes I agree Brown is playing very good...kinda like he did in last years playoff run, which is good news all around!